This is a selection of Geoff’s articles, conference papers and interviews on Australian and American history. ‘Capitalism and socialism in the American century’ (paper presented to the symposium on Social Democratic parties and Business, University of Sydney, 28 September, 2009. ‘Labour history and business history in Australia; exploring the links’, in B. Oliver, ed., Labour History in the New Century, Black Swan Press, Perth (proceedings of the 2009 national conference of the Australian Association for the Study of Labour History). ‘From Labourism to Social Democracy; Labor Governments and Fiscal Policy in the Australian States’, Labour History, 96 (2009). ‘The All for Australia League in New South Wales: a study in political entrepreneurship and hegemony’, Australian Historical Studies, vol. 31, no. 1 (2008). 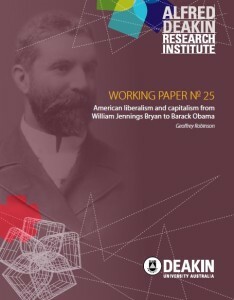 ‘The Australian Class Structure and Australian Politics 1931-40′ (paper presented to the 2008 Australian Political Studies Association conference). Australia’s Prime Ministers: Bob Hawke (an ABC Overnights interview on 8 October 2007). Australia’s Prime Ministers: R. G. Menzies (an ABC Overnights interview on 7 August 2007). ‘Public finance and income distribution in interwar Australia: towards a class analysis’, in J. Kimber, P. Love & P. Deery, eds., Labour Traditions: papers from the tenth national labour history conference, Australian Society for the Study of Labour History, Melbourne, 2007 (charts and tables here). A south-western history of the world: Locating the south-west in its national and global context (PowerPoint presentation to the Faculty of Education Conference, Bringing the Community into the Classrom, 6 October 2006). ‘Labourism in Action: Jack Baddeley, the Trade Union Secretaries’ Association and the New South Wales Industrial Conciliation and Arbitration Bill 1931’ , in G. Patmore, J. Shields & N. Balnave, eds., The Past is Before Us: Proceedings of the Ninth National Labour History Conference, Australian Society for the Study of Labour History and the Business and Labour History Group, University of Sydney, 2005. ‘Labourism in Action: Jack Baddeley, the Trade Union Secretaries’ Association and the New South Wales Industrial Conciliation and Arbitration Bill 1931’ (this is the first version of this paper presented to the 2005 Labour History conference which contains additional material on the Bill and some comments on the contemporary crisis of Australian labour that the referee objected to but which I stand by). 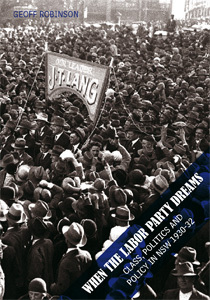 ‘The making of a labour electorate 1890-1930: a comparative analysis of Australia and Germany’ (this is the first version of the paper presented to the 2003 Labour History conference it contains a discussion of parallels between Australian Labor and German Social Democracy that were largely omitted from the final paper). The 1950 Victorian Railways Strike: A Study in the Dynamics of Union Leadership and Industrial Arbitration in Cold War Australia (B.A. (Hons), University of Melbourne, 1994). ‘Railway Work: Some Aspects of Industrial Relations and Labour Management in the Victorian Railways 1912-1920′ (this was a research essay for the University of Melbourne undergraduate unit Labour History in 1992. It was based on material in the University of Melbourne Archives). “A Sop to the ‘Oi Polloi’: Capital, Labour and the Reform of New South Wales Maritime Administration 1867 to 1914′, Australian Journal of Public Administration, vol. 51, no. 1 (1992) (based on my Sydney honours thesis. Poulantzas is applied to the problem). ‘The decline and fall of an Australian radical agrarianism: patterns of Labor Party support in western Queensland 1946-87 in an international context’ (this was written in 1988 and I was unable to find a publisher. It is a lengthy analysis of the decline of Labor support in ‘outback Queensland’ (once Labor heartland) with a particular focus on the elections of 1957 and 1974 together with some comparisons to the Canadian prairies, in retrospect my suggestions about the possibility of similar realignments in urban Australia appear prophetic. I interviewed some Labor MPs and candidates).